This post has been created to explain how to remove the July 2017 version of Mole ransomware and how to restore the .MOLE00 extension encrypted files. 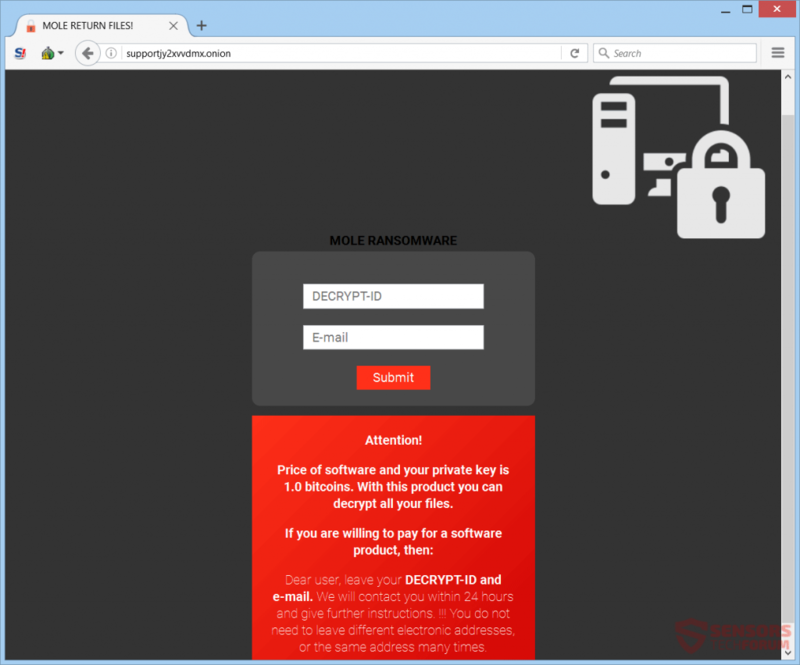 A new updated version of the Mole ransomware virus has been released in the wild, encrypting files with the added .MOLE00 file extension. The cyber-security experts believe that it’s code is still based on the initial ransomware it has been created from – CryptoMix ransom family. The distribution of the .MOLE00 file virus is conducted via malicious e-mails sent all over the globe carrying malicious e-mail attachments or suspicious web links. Once the malicious infection file of .MOLE00 file virus is activated, it downloads the payload of the virus and begins encrypting files. The virus then leaves behind a ransom note, asking the victim to pay a hefty ransom fee for the recovery of the files. Short Description The ransomware virus is still believed to be a variant of CryptoMix. After encryption, it will display a detailed ransom note with payment instructions. Symptoms The ransomware will encrypt your files and then place the extension .MOLE00 on each encrypted file. User Experience Join Our Forum to Discuss .MOLE00 File Virus. Be advised to be careful what types of files you open when you receive an e-mail or download a torrent or a setup of a free program online. We also recommend to follow the ransomware protection tips for further safety. Besides the original payload file, the virus may also drop multiple other support files in those folders. These files have similar functions to the ransomware virus on which .MOLE00 is based on – CryptoMix. When the malicious file is downloaded on your computer, it will immediately be ran as an administrator without you noticing and the virus will begin it’s malicious activities. One of those activities is to possibly attack the Run and RunOnce registry sub-keys in Windows. In those keys, value strings belonging to .MOLE00 file virus may be created which aim for one thing only – to run the malicious file of the virus automatically on Windows startups. Those value strings have random names and based on them, you can find the file-encrypting malicious file’s location. RSA (Rivest-Shamir-Adleman) cipher with bit strength of 2048 bits. AES Encryption (Advanced Encryption Algorithm) with a bit strength of 128 bits. The first cipher (RSA) is likely used to generate public and private keys of the already encrypted files by the AES algorithm. This is like a doubled shield against direct file decryption. It can only be reverse-engineered if there is a master key or a bug in the code of the encryption file which may allow researchers to create a decrypter in the future. For the removal process of this ransomware infection, we strongly suggest that you focus on backing up the encrypted files beforehand. Then, it is recommended to follow the removal instructions below. Take into consideration that removing Mole ransomware may be a risky process due to the modifications in Windows it does, which may break your OS if care is not taken. This is why, experts suggest to use an advanced anti-malware software which will allow you to remove the malware automatically and safely. If your files are encrypted, do not despair, because you can still recover some of them. This can be done with alternative methods such as the ones we have suggested in step “2. Restore files encrypted by .MOLE00 File Virus” below. Be advised to try them only after a backup and only with copies of the encrypted files. Threats such as .MOLE00 File Virus may be persistent. They tend to re-appear if not fully deleted. A malware removal tool like Combo Cleaner will help you to remove malicious programs, saving you the time and the struggle of tracking down numerous malicious files. Threats such as .MOLE00 File Virus may be persistent on your system. They tend to re-appear if not fully deleted. A malware removal tool like SpyHunter will help you to remove malicious programs, saving you the time and the struggle of tracking down numerous malicious files. Note! Your computer system may be affected by .MOLE00 File Virus and other threats. SpyHunter is a powerful malware removal tool designed to help users with in-depth system security analysis, detection and removal of threats such as .MOLE00 File Virus. 1. Install SpyHunter to scan for .MOLE00 File Virus and remove them. 2. Scan with SpyHunter, Detect and Remove .MOLE00 File Virus. Ransomware infections and .MOLE00 File Virus aim to encrypt your files using an encryption algorithm which may be very difficult to decrypt. This is why we have suggested several alternative methods that may help you go around direct decryption and try to restore your files. Bear in mind that these methods may not be 100% effective but may also help you a little or a lot in different situations. Note! Your computer system may be affected by .MOLE00 File Virus or other threats. Remove .MOLE00 File Virus by cleaning your Browser and Registry. Fix registry entries created by .MOLE00 File Virus on your PC. Combo Cleaner is a powerful malware removal tool designed to help users with in-depth system security analysis, detection and removal of threats such as .MOLE00 File Virus. Step 5: In the Applications menu, look for any suspicious app or an app with a name, similar or identical to .MOLE00 File Virus. If you find it, right-click on the app and select “Move to Trash”. Step 6: Select Accounts, after which click on the Login Items preference. Your Mac will then show you a list of items that start automatically when you log in. Look for any suspicious apps identical or similar to .MOLE00 File Virus. Check the app you want to stop from running automatically and then select on the Minus (“–“) icon to hide it. Remove .MOLE00 File Virus – related extensions from your Mac’s browsers. A pop-up window will appear asking for confirmation to uninstall the extension. Select ‘Uninstall’ again, and the .MOLE00 File Virus will be removed. When you are facing problems on your Mac as a result of unwanted scripts and programs such as .MOLE00 File Virus, the recommended way of eliminating the threat is by using an anti-malware program. Combo Cleaner offers advanced security features along with other modules that will improve your Mac’s security and protect it in the future. Hey !, I found this information for you: ".MOLE00 File Virus – Restore Files (Update July 2017)". Here is the website link: https://sensorstechforum.com/mole00-file-virus-remove-restore-files-update-july-2017/. Thank you.